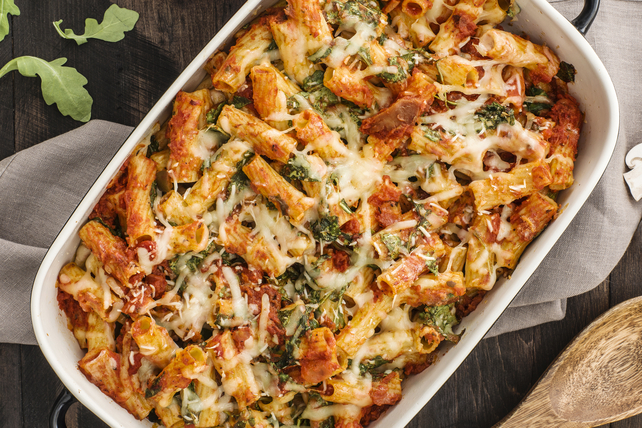 No need to roast fresh vegetables for this Roasted Vegetable and Arugula Rigatoni Bake. By using our CLASSICO Riserva Roasted Vegetables Pasta Sauce, your prep time is reduced by about 40 minutes since the roasted vegetables are already in the sauce. Only you will know how quick this recipe comes together! Toss pasta with pasta sauce, arugula and 3/4 cup shredded cheese; spoon into 2-L casserole dish sprayed with cooking spray. Bake 25 min. or until heated through, uncovering after 20 min. Add 1 lb. (450 g) cooked cleaned medium shrimp to pasta mixture before spooning into prepared casserole dish and baking as directed.